So far in this series we’ve been looking at exporting data to Excel from a single table (Contacts). Today we’re going to extend the technique to encompass a second related table, Donations, and without too much trouble we can leverage existing work from earlier entries in this series (part 1, part 1.1 and part 2). To avoid unnecessary repetition, this article assumes familiarity with the aforementioned predecessors, and you can follow along in today’s accompanying demo file, excel exports, part 3, if you are so inclined. This entry was posted in Level: Intermediate, Version: FM 9 or later and tagged Evaluate, EvaluationError, Excel, Export, Translation Table, ValuePosition on March 8, 2012 by Kevin Frank. …to this, with no loss in functionality. This entry was posted in Level: Intermediate, Version: FM 9 or later and tagged Evaluate, EvaluationError, Excel, Export, Translation Table, ValuePosition on February 25, 2012 by Kevin Frank. a) live preview fields showing the data to be exported. b) an “Eval Error Tester” script to make sure the output code in the alias table is well-formed. Thank you Bruce for making this available. This entry was posted in Level: Intermediate, Version: FM 9 or later and tagged Evaluate, EvaluationError, Excel, Export, Translation Table on February 20, 2012 by Kevin Frank. This entry was posted in Level: Intermediate, Version: FM 9 or later and tagged Evaluate, Excel, Export, Translation Table on February 20, 2012 by Kevin Frank. 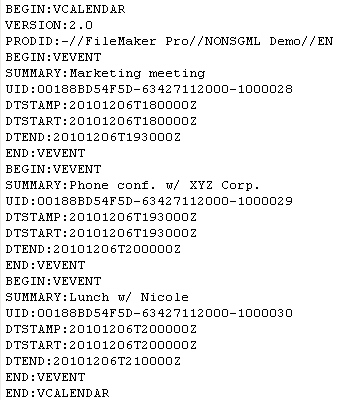 The other day I needed to export some appointments from FileMaker to iCal. I’d never done this before, but I did a bit of reading on Wikipedia and elsewhere, and it turns out to be fairly straight forward. I don’t claim that what follows is in any way authoritative, just that it works… and not just with iCal, but with Outlook, Google Calendar and any other program that recognizes the iCalendar format. Let’s start with a basic table of appointments, like this. Let’s take a closer look at the body section. The BEGIN, SUMMARY and END entries seem self-explanatory, but what’s going on with those “DT” entries? Well, as you’ve probably guessed, they’re timestamps. First we have the date formatted as YYYYMMDD, followed by a T, followed by the time in 24hour format, hhmmss, followed by a Z. One important observation about the time portion: it is represented as UTC time, not local time. So the first row in our appointments table, with a starting time of 10:00 Am, will be converted to the UTC equivalent of 180000 when we export it, because the database is located in the Pacific time zone, which is 8 hours offset, i.e., UTC-08. During Daylight Savings Time, the offset value would be -7, but we’re on Standard Time now, so the correct value is -8. Clearly DTSTART is the beginning time for the appointment, and DTEND is the ending time, but what’s DTSTAMP? That is the “creation time” of the appointment, and apparently is required. Since I don’t care about that, I’m just making it the same as DTSTART. And finally we come to the UID entry, which is simply a unique serial number. OK, I lied. Ideally it’s some form of “UUID” which means that heroic measures have been taken to attempt to guarantee its absolute uniqueness. But as long as it’s unique within your calendar, you’ll be fine. The UID is very important, because if you import the same appointments more than once, the calendar will be smart enough to update existing entries where there is a matching UID, rather than allowing them to appear twice. That’s right… if an appointment changes in your database, you can export it, and reimport it into your calendar without having to worry about duplicates. So, let’s add a UID field (auto-enter, text) and a UTC offset field (global, number). Now that we understand the design of a minimal “ics” file, we can define a calculation field, ical_basis, in our database to assemble and format the data accordingly. Reminder: the first thing we do when we define a calculation field is, of course, make sure the result type is correct: in this case we want the result type to be text. Also, let’s set the storage type to “unstored”. This calculation is the heart of the whole operation. Its main purpose is to generate one body segment per appointment record. Additionally, it will create the header at the beginning of the first record, and the footer at the end of the last record with the help of the “rn” and “fc” variables. Let’s reduce our found set to three records, go into preview mode and see how that calc evaluates. Looks like we’re home free doesn’t it? …a text file with three lines, each a mile long. While inconvenient, this makes sense if you think about it. When you export to a text file, FileMaker uses ASCII 13 as the record delimiter, i.e, puts a hard return between the data from each record. To avoid confusion, any existing hard returns from within the source data are converted to a “vertical tab” character (ASCII 11). A. Generate the text file, and then post process the file using some sort of external technology. B. Parse each row of ical_basis into a separate record, and then export those records. …and no more pesky problem. 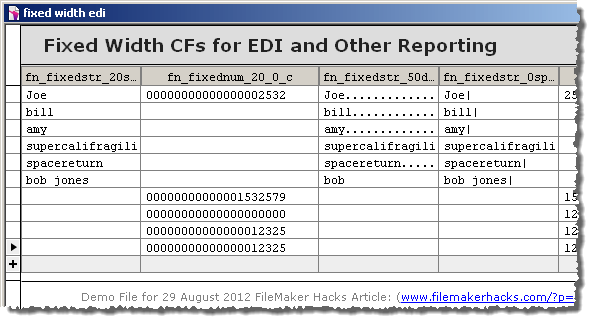 Method B involves creating a special table to facilitate the generation of the ics file. As with method A, there are any number of ways to accomplish this, but the one I want to look at here is Bruce Robertson’s Virtual List technique. It’s a highly versatile tool to add to your box of tricks, and it also happens to score a perfect 10 on the coolness scale. Here’s a basic explanation of how Virtual List can be implemented to solve this particular problem, and don’t worry if it doesn’t make immediate sense. You don’t have to fully understand it to reap the benefits, and the act of implementing it in one of your solutions will help you understand it better. Create a new table in your solution. 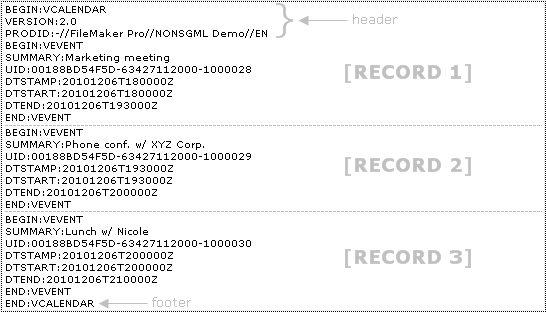 Name the table VL_Utility, and don’t create any records yet. 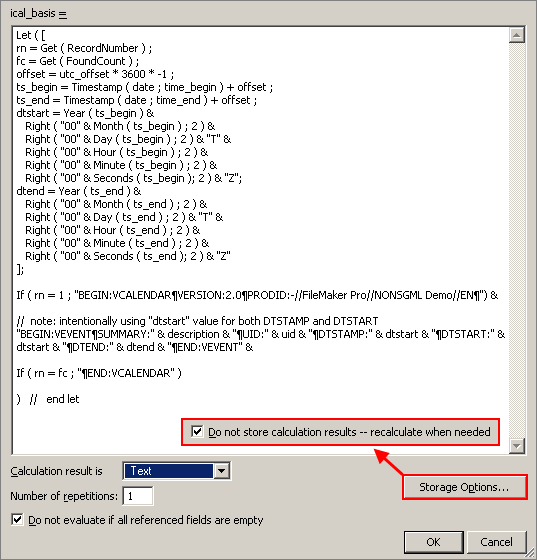 Define a number field, serial_number, as an auto-enter serial number with an initial value of 1. Create “more records than you’ll ever need” in this table. If that sounds unhelpfully vague, why not start with 10,000? You can always add more later. Back in your Appointment table, locate the found set you wish to export. 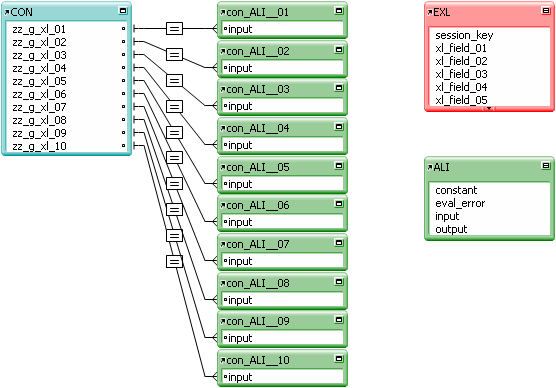 Using a looping script, walk the records and populate the $$virtual_list variable. Define a variable, $vc, as ValueCount($$virtual_list) . Locate records in VL_Utility where serial_number <= $vc, and make sure these records are unsorted. The result looks like this and is ready to import into your calendar program. For Google Calendar, you can import entries by clicking the “Add” button at the left of the calendar. On the Mac, you can import an “ics” file to iCal by double clicking it, and for Outlook choose Import and Export from the File menu. Here’s what we see after importing. This entry was posted in Level: Intermediate, Version: FM 10 or later and tagged Export, Google Calendar, iCal, Outlook, Timestamp, Troi File, UTC, UUID, Virtual List on December 13, 2010 by Kevin Frank.